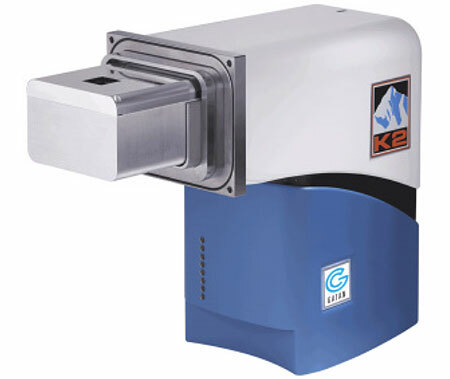 At present only the Gatan K2, when operated in counting mode, can produce a DQE(0) as high as 80% in conjunction with reasonably small exposure times. The K2 detector frame rate is about 10 times higher than that available with the two other detector brands. The K2 Summit electron counting direct detection camera is the highest performance detector available for cryo-electron microscopy (cryo-EM). The unmatched frame rate enhances both contrast and resolution for large and small molecules alike. 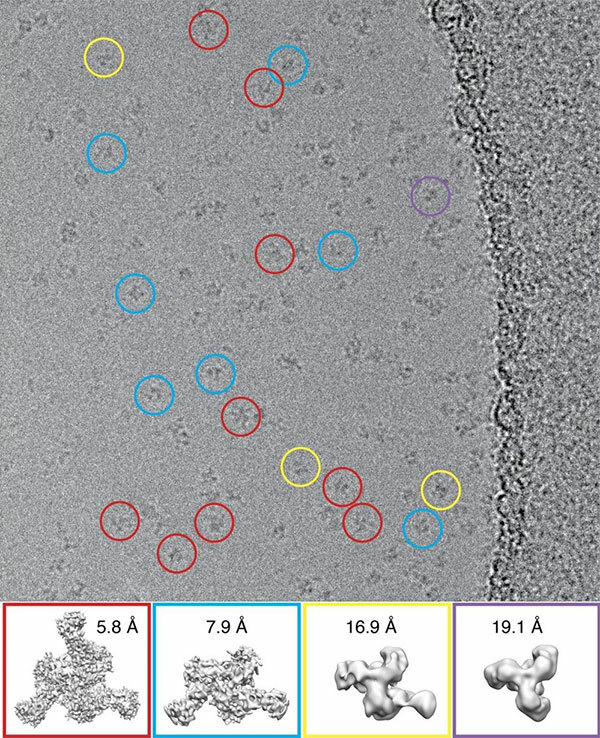 Molecule size versus resolution for published single particle cryo-EM structures. The K2 Summit or Quantum LS have been used for all structures at the high resolution frontier across a range of molecular sizes. The resolution of a traditional EM camera is limited by electron and photon scattering in the scintillator or fiber optics, or by the inherent limitations of lens coupling. When it enters the camera, each electron event is delocalised into a cloud of light. This point spread function (PSF) exacerbates at higher beam energies. 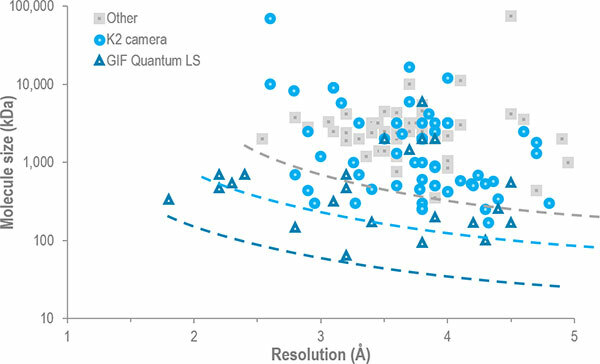 Image quality is further limited n traditional cameras by noise from statistical variation in electron scattering and the energy deposition processes, read noise from the camera electronics and from distortion and fixed patterns from the fiber optics or softening caused by lenses. Direct detection cameras receive electrons directly onto the sensor. This eliminates the need for scintillators, fibre optics and lenses and also greatly reduces PSF. In counting modes, noise can be essentially eliminated. With the transmission sensor, the number of scattered electrons re-entering the detector from below is kept to an absolute minimum. A unique capability of the K2 Summit 4k x 4k direct detection camera is counting individual electrons, rather than traditional integration of their analogue signal. The K2 Summit has unmatched sensitivity and DQE, which are the main measures for judging and comparing high resolution EM cameras. Study heterogenous particles with higher contrast. These four particles are found when mixing HIV-1 envelope glycoprotein trimer with antigen binding region of an anti-HIV antibody, in rational vaccine development. Lyumkis et al., 2013 Science.